Sometime early next week, or perhaps sooner, the major news organizations will be presenting their most likely outcomes of the 14 December 2014 House of Representatives elections. These outlooks will be based on reporting and polling from the prefectural and regional bureaus, combined with sophisticated analysis of past voting records and a jaundiced view toward voter turnout, which, if one goes by the traditional indicator questions of "How much interest do you have in the upcoming election?" and "How definite is your wish to go to the polls on election day?" is on course for a historical and possibly delegitimizing low. However, let us assume, for argument's sake, turnout is closer to historical norms, i.e., greater than 59%. And let us assume, and this would not be for argument's sake but simply because it can be inferred, that every additional voter showing up will be voting against the Liberal Democratic Party, both in the district and the proportional vote, save in the districts where the choice is between an LDP candidate and a Japan Communist Party (JCP) candidate. 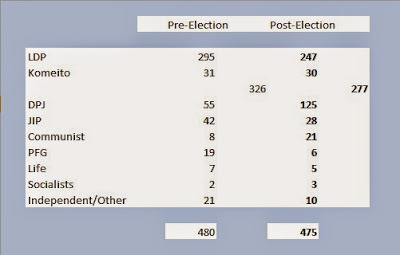 I took a look on Monday at the projected list of candidates in all 295 districts. Based upon that list and small set of rules-of-thumb, I tried to arrive at an estimate of the worst possible reasonably plausible result for the ruling LDP/Komeito coalition. - When an LDP candidate and a Democratic Party of Japan candidate with an equal number of elections to the Diet face off in a district, the LDP candidate wins. - When an LDP candidate faces off against a DPJ or a Japan Innovation Party candidate with a higher number of elections to the Diet, the opposition candidate wins. - When and LDP candidate faces off against a DPJ candidate and a candidate from the JIP, and neither the DPJ nor the JIP candidate has two or more elections to the Diet than the LDP member, the LDP candidate wins. If either the DPJ or the JIP candidate has two more elections to the Diet than the LDP candidate, an opposition candidate wins. - If an LDP candidate faces off against a DPJ candidate or a JIP candidate of any status, and a Party of the Future Generations candidate is also in the running, the LDP candidate loses. - The Komeito wins all 9 of its district electoral contests. - Veteran candidates with more than 7 elections to the Diet win their districts, irrespective of party allegiance. - The LDP loses only 48 seats -- remember this is a worst case scenario -- and with their Komeito allies finish 9 seats above the crucial 266 seat "absolute safety" line where the coalition possess both all the chairs of Diet committees and a greater than 50% majority in all the committees -- meaning that any and all coalition-sponsored legislation passes out of committee without incident. - The DPJ hits its goal of three figures with plenty to spare. - The Communists nearly triple their representation. Yikes. - The JIP, despite having two dynamic leaders in Eda Kenji and Hashimoto Toru, gets mauled. This is just a first approximation. Probably a lot more independents with local followings will get through (the drop in the independents number looks suspect). Remember also this is assuming that a lot more folks vote than the major news organizations currently think are likely to show up at the polls. 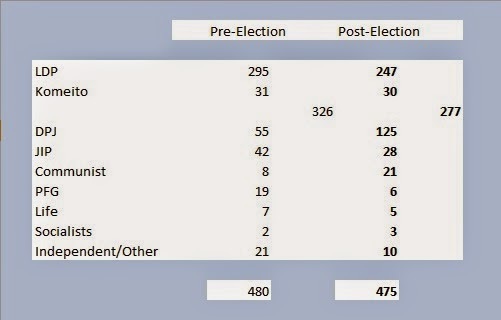 Later - The major news organizations have checked in with their projections, based upon their internal numbers...and they are saying the coalition ends up with greater than 300 seats. Interestingly, or perhaps not, they find the same surge for the Communists I noted in my above "worst case for the LDP" scenario. "Prediction" which ended turning out (eerily?) accurate.